Twins, spins and wins! 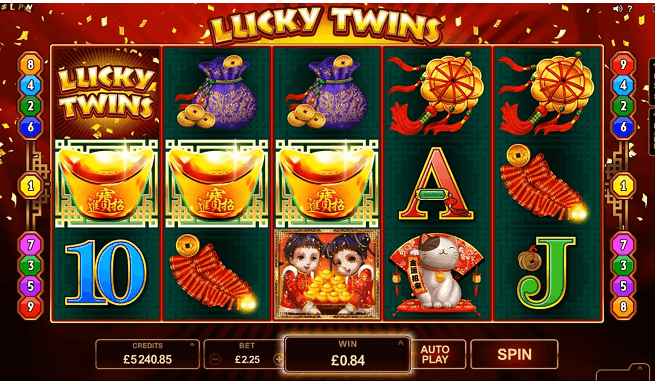 This is the motto of the enchanting Asian themed online slot, Lucky Twins. Discover how the colours represent good luck, harmony and wealth with the Asian folklore icons, known as the Fortune Children. Control the game’s rhythm with the SPIN/STOP button and feel the freedom at GoWild. Prosperity and abundance are at your doorstep with this 5 x 3 reel, 9-payline game, that has an accessible minimum bet of only 0.25 and wins of up to 25 000.00. Your wishes have reached the ears of the great Jade Emperor who has sent in your path the Lucky Twins online slot.